The largest state park along Lake Michigan and one of the largest in the Lower Peninsula is Ludington. The 5,300-acre state park in Mason County includes 5.5 miles of Great Lake shoreline, 4 miles along popular Hamlin Lake and a 1,699-acre Wilderness Natural Area. The terrain varies from wind-blown sand dunes to gently rolling pine forests. Much of the dunes, from Lake Michigan to a half mile inland, are treeless areas of dune grass and scrub. Others are covered in jack pine. The state park's most picturesque fixture is Big Point Sable Lighthouse, an impressive tower among the dunes that was built in 1867. From the lighthouse to the northern boundary is the park's Wilderness Natural Area, a trailless and undeveloped section of mostly forested dunes. This unique "dune wilderness" continues, as bordering Ludington to the north is Nordhouse Dunes, a declared federal wilderness that is managed by the Manistee National Forest. 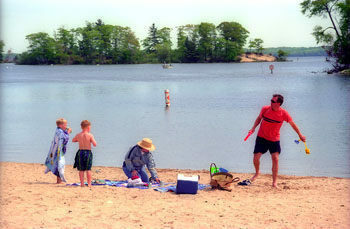 The miles of sandy Lake Michigan shoreline, the most of any unit in the state, the many coves and inlets of Hamlin Lake and the appeal of dune country have made Ludington a popular park. Ludington draws 840,000 visitors a year as one of the most heavily used units in the state park system. Although there is year-round activity in the park, the majority of the visitors come during the summer to enjoy the beaches, campground and scenic network of foot trails. The park’s trail system was re-routed in 2000 and there are now eight named and color-coded hiking trails that form an 21-mile network. 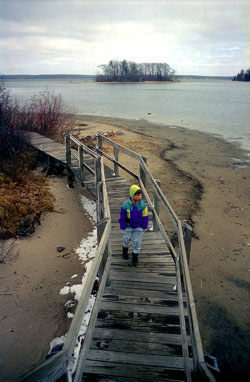 Almost all the routes are located north of the Sable River, except for Sable River Trail and the mile-long Skyline Trail that features an extensive boardwalk on the crest of a dune. One of the more popular destinations for hikers is the Big Point Sable Lighthouse, that can be reached via the Logging and Lighthouse Trails, an access road open only to park maintenance vehicles or a 2-mile walk along the shoreline. An excellent day hike is to follow the Ridge Trail, which passes several highpoints with good views of Hamlin Lake and then return along Island and Lost Lake Trail, which skirts the interesting shoreline between Hamlin and Lost lakes. The trailhead for Ridge Trail is in Cedar Campground, while Lost Lake Trail begins from the day-use area of Hamlin Lake. The entire loop would be a 4- to 6-hour hike. The most unusual trail in the park is the Ludington State Park Canoe Trail, a 4-mile, three-hour paddle into a serene world of ponds, coves and marshes along the southwest shore of Hamlin Lake. Built in 1992, the canoe trail was the first of its kind in a state park and is still the longest one in Michigan. It features directional signs to keep you on course, small landing docks and an interpretive brochure that explains the passing scenery. Six very short portages allow you to loop through protective bayous and ponds to totally escape the motorized traffic on Hamlin Lake. 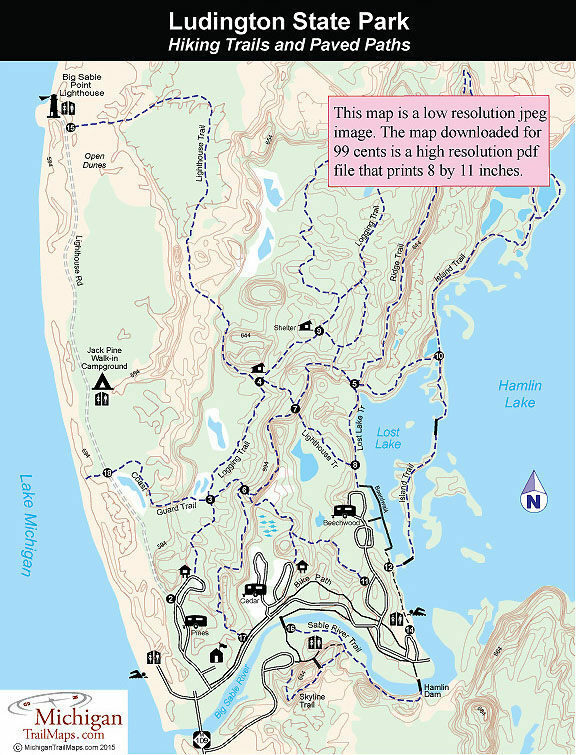 Ludington State Park also has 2 miles of paved bicycle paths that connect all three campgrounds and cross Sable River to Skyline Trail and 10 miles of Nordic trails. North Ski Trails are a 6-mile loop that begins at the Winter Warming Shelter and follows the Loggers Trail most of the way. The South Ski Trails depart from near Sky Line Trail and consist of a loop with four cross spurs for runs that range from 1.5 miles to over 4 miles in length. Big Sable Point Light Station was built in 1867 and today includes an interpretive room and a gift shop on the first floor and the tower that visitors allowed to climb for a view of Lake Michigan. 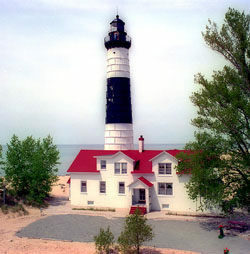 For more information about Big Sable Point Lighthouse contact the Sable Points Lighthouse Keepers Association (231-845-7417, http://www.splka.org/).